As the state of Minnesota seeks to generate 25 percent of its power from renewable sources by 2025, communities are finding both that they can be part of that solution and that solution can be part of the future of their community. "This is the biggest investment Willmar Municipal Utilities has ever made," says chief engineer Wes Hompe about a pair of 2-megawatt wind turbines costing nearly $10 million. "What makes it worthwhile? This is the future." "Get small and get in!" is the new message from the federal government, according to Denis Thoet, who manages Long Meadow Farm in West Gardiner, Maine. In his Kennebec Journal article "Wisdom of helping small farmers begins to take root throughout U.S.," he contrasts USDA programs that for decades have benefited expansive agricultural operations with new programs that can benefit smaller farm operations. While South Dakota currently only has 288 megawatts of wind power capacity installed, the state is experiencing the benefits of the wind industry, explains South Dakota Wind Energy Association Executive Director Steve Wegman in a interview by the National Association of Farm Broadcasting News Service. Jim Boyd coordinates a wind working group in Grand Marais, Minnesota on the North Shore of Lake Superior. Windustry has been working with the group for over the past year to explore the possibility of a Community Wind project there. 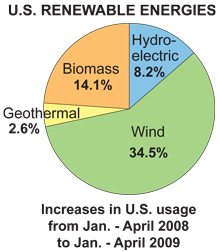 In the first four months of 2009, wind energy expanded 34.5 percent compared to the same months of 2008, according to the U.S. Energy Information Administration's most recent Monthly Energy Review. One of our goals here at Windustry is to link people together across the country who are working in a proactive manner with models of wind energy production that enhance local ownership and are beneficial to rural landowners. We Energies will offer grants for qualified We electric customers (not-for-profit, schools and units of government) with the installation of a wind electric system over 20 kW and not more than 100 kW. Customer incentives are provided from We Energies Renewable Energy Development (RED) Program. Melissa Peterson, program analyst at Windustry, was quoted in the article "Lawyers, non-profits shed light on wind industry" in The Journal [New Ulm] after speaking to farmers, landowners, city and county officials at the Springfield Community Center. "We've seen these documents range from the good, bad, and ugly," Peterson said. Peterson added that landowners that form their own wind energy group with local investors can create projects faster and easier than by private firms dealing with individual landowners.